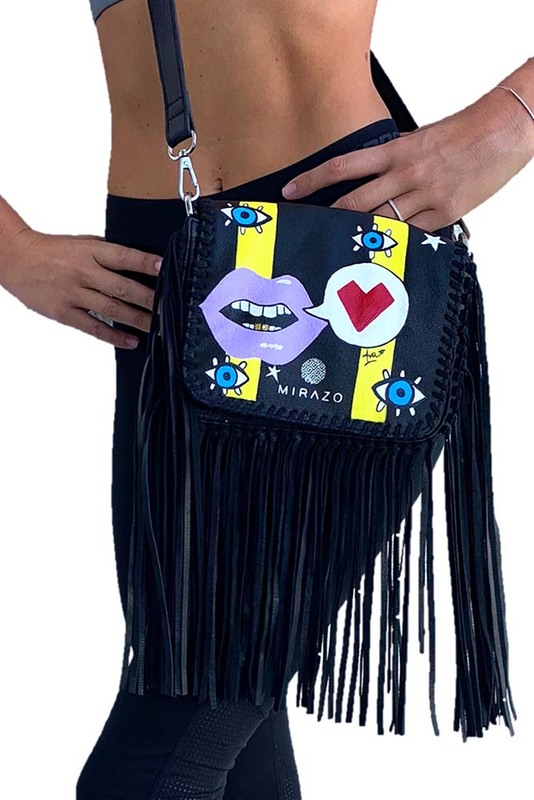 The Mirazo Crossbody bag X Official Avamae is a one of a kind goat leather bag with suede leather lining, hand painted by modern pop artist Official Avamae. 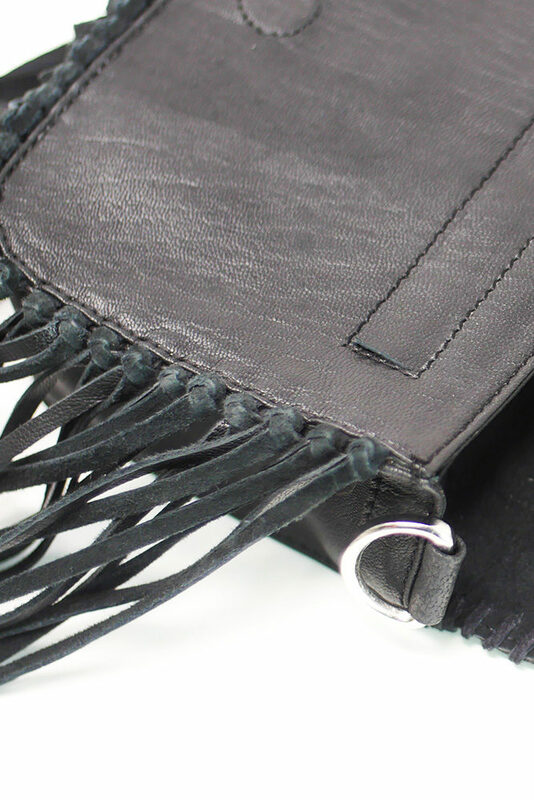 It features fringe edge and whipstitch trim. Soft and light, It comes in 3 different colors. This one is all black. 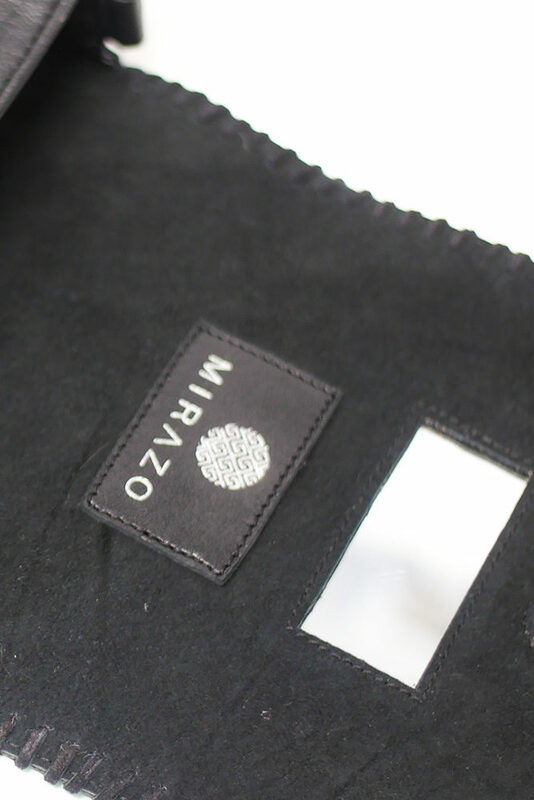 The mirror that you can find inside and the different compartments make this a very practical bag. It has plenty of room with a zippered compartment on the front outside and two pockets inside. Suits both daily and vacation uses perfectly (fits your keys, phone, make-up or/and sunglasses. We imagine a very dynamic and curious woman, she multi tasks and needs to keep her hands free. As a PR professional, she runs from office to office and holds 100 different things during the day (her coffee, her computer, some clothes,…). During the night she likes to go to different events, tonight she’s meeting her friends at a music concert, this Mirazo Crossbody bag is exactly what she needs! Wear It multiple ways: clutch, crossbody bag, waist bag or shoulder bag. 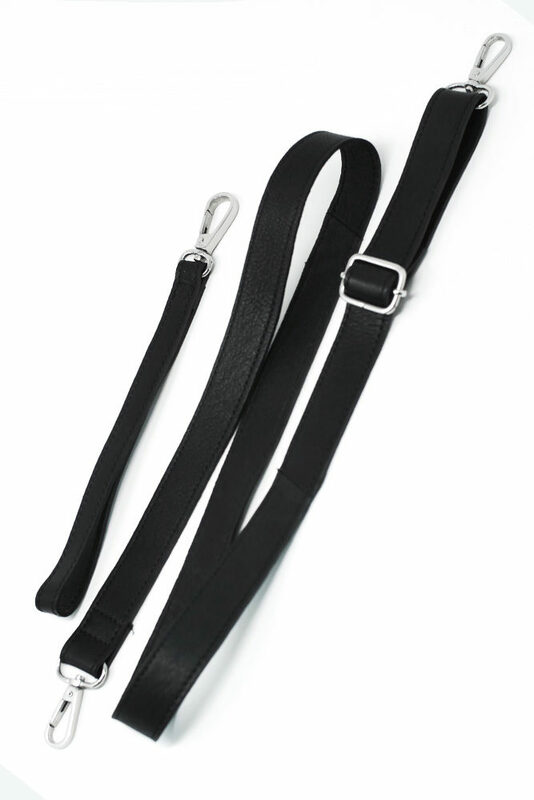 It comes with detachable adjustable shoulder strap and detachable clutch handle. We recommend that you avoid exposure to direct light and any source of heat or moisture. Handmade with love with Indian techniques in Tri Nagar for the beautiful women who inspire us. The bag’s artwork was designed and hand painted with premium leather paints by modern pop artist Official Avamae. Ava-Mae uses bold colors and sharp concepts to relay her work’s message; that the intention and sole purpose of existence is truth. Her art is her imprint in life and her mission is to create awareness, and stimulate change through the exploration of hypothesis and renditions of realism. Ava-Mae believes that her job as an artist is to continue to highlight and record the times through her work, using culturally relevant themes and ideologies to unapologetically inspire conviction and conversation. ***The 5% discount on your first order doesn’t apply to this bag since It’s a unic item.